china glaze put out a khrome collection a few months ago and millennium is the one i picked out of the bunch. 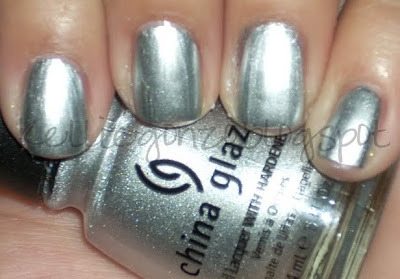 it's a true chrome-like silver polish with a gorgeous metallic shine. these polishes dry almost immediately so they can be a bit tricky to apply but they are opaque in one coat so you could forgive them that :) this is two, because i had some brush strokes to cover. we're finally getting some snow here in utah, it's been a surprisingly mild winter compared to last year! bad air pollution this time tho, due to being located in a valley--so i've already gone a few rounds with bronchitis and coughing-colds. fun times huh. hope your week is going well!